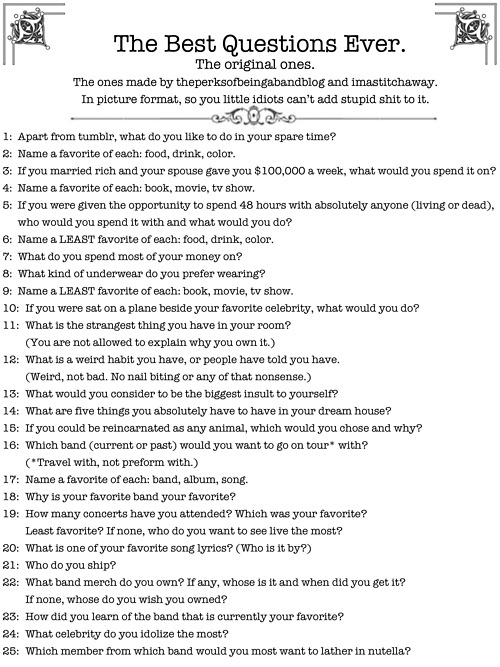 I actually came across this little questionnaire on Pinterest (not tumblr). It's been awhile since I did a fill in the blank Friday post, so I thought I'd give this a go. It's 100 degrees again today in Pittsburgh. I'm beating the heat indoors with the AC cranking at my sister's place and needed something to do online! 3. I wouldn't even be capable of consistently spending $100,000 per week. I would become overwhelmed with the amount of material things that I consumed. I assume with that kind of money there would be plenty of free time. I would put the money towards travel and my house(s). 4. Book: What Remains by Carole Radziwill. I'm almost done reading it. I love her writing style and her perspective on life. Movie: Before Sunrise. Because of this film, I have a burning desire to see Vienna. TV Show: Summer Heights High will always be a favorite. I just wish it lasted beyond one season. 5. Myself from a past life- spending the 48 hours wherever I lived and doing the things I loved. 6. Food: Tuna. Drink: Milk, Tequila. Color: Red. 7. I don't really spend a ton of money on one thing specifically but I guess it would be clothes in the fall/winter and concert tickets in the summer. 8. I hate underwear but I guess if I had to pick, I'd go with cheeksters from Victoria's Secret. 10. I would strike up a conversation. I do this with just about anyone who sits next to me on planes. I would obviously use it as an opportunity to learn more about them. 11. A clipping of my dog's fur who passed away a few years ago. 12. My sleeping patterns. I'm not a night owl. I'm nocturnal, maybe even a vampire. 13. The biggest insult you could throw me is that I'm average/common/boring/unoriginal. You don't have to like me but I at least like to be unique. 16. Portugal. The Man because I love their music and would never get tired of hearing them perform every night. I also think the members seem like such interesting people. The lead singer is also gorgeous. 17. Well, I just mentioned them. From their albums, my favorite is a toss-up between The Satanic Satanist with "The Sun" being my favorite song and In The Mountain In the Cloud's "Sleep Forever." But I love just about all of their songs. "And I" from Censored Colors is a favorite as well. I like their "Helter Skelter" cover better than The Beatles' version. 18. They don't have a bad song. They're great live. They work hard. They're interesting. They're original. They're nice to look at. 19. Of my favorite band? I've seen them twice. In general? More than I can count. One of my favorite concerts was The Dead Weather at Bonnaroo 2010. Who do I want to see the most? I still haven't seen TV on the Radio or Bon Iver. MGMT keeps eluding me as well. 20. "Staring at the Sun" or "Wolf Like Me" by TV on the Radio. 21. I think I knew what this meant but I had to Google it to make sure since I'm not 14-years-old. The answer would be Prince William and Kate Middleton. I love her. 22. I don't own any band merch. I just don't. I buy their music and their concert tickets. I don't wear their t-shirts or buy their posters. 23. I learned about Portugal. The Man through Twitter in January 2010. I was following a guy I had a crush on who had excellent taste in music. He was "#nowplaying" "The Sun" and the name Portugal. The Man jumped out at me. They get a lot of slack for having such an odd band name but I probably wouldn't have bothered checking them out if their name wasn't so off the wall. I loved it and bought their album then found out they were playing my city, so I went to see them in March. 24. I don't idolize celebrities. I have crushes on a few and look to some for style inspiration but by no means do I idolize anything or anyone. Check out my Pinterest Street Style and Dream Guys boards for a few clues. *First time hearing it and I'm loving it!